Reva Rice is starring in “Vegas! The Show” at the Saxe Theater in Miracle Miles Shops at Planet Hollywood. African-American entertainers — legendary names like Sammy Davis Jr., Lena Horne, Nat King Cole, Ella Fitzgerald, Louis Armstrong, Redd Foxx, George Kirby, Barbara McNair, Josephine Baker, The Treniers, Dorothy Dandridge and The Nicholas Brothers come to mind — were essential to not only building its reputation as the world’s entertainment capital, but helping set a standard for the advancement of equal rights. Today, a new generation of black performers are on stages all over the Strip, playing a central role in attracting an estimated 2.5 million visitors to Las Vegas each year. With the advent of modernized hotel properties and other amenities, the Strip’s growing reputation as an “adult Disneyland” has brought a growing number of people to the city in search of a good time. But in the eyes of some, the explosion of venues has resulted in a sometimes negative impact on black performers. Adding to the angst, many Strip performers now work without contracts — meaning they often work on a day-to-day basis. Miles says the situation has resulted in an atmosphere where the competition is fierce among entertainers hungry for consistent work. Today, she is a headliner in the well-received “Vegas! The Show” at the Saxe Theater in Planet Hollywood’s Miracle Mile Shops. The show pays tribute to such renowned entertainers as Sammy Davis Jr., Tina Turner and Gladys Knight. “It is a wonderful show that talks about the history of Vegas, traditional showgirls and (it features) something that is not seen any more in Vegas — a full 11-piece orchestra. There are 30 performers that will take you back in the day,” said Rice. Asked about the hectic lifestyle of a Las Vegas entertainer, Rice described a typical day. Performing in Las Vegas can also be a family affair. Kip Mungin and his fiancée, Anika Ellis, have established the KAM Entertainment Co., which is comprised of such bands as Yellow Funk and 3.0. The energetic couple performs both original songs and covers, with Nungin serving as a lead vocalist and drummer in the ensemble. 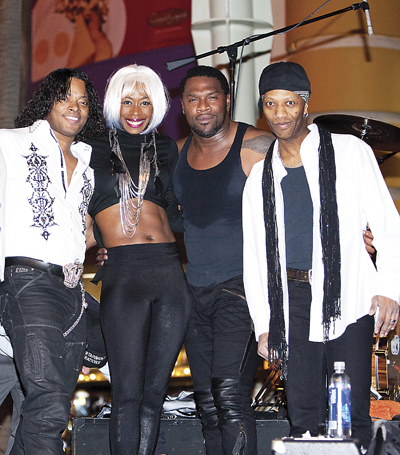 D’La Vance, from left, Anika Ellis, Kip Mungin, and Rhoney G.
“When I first came to Las Vegas, I was performing with a band called Isis, at The Mirage hotel in the lounge,” recalled Mungin, who composed a song about Hurricane Katrina shortly after arriving here from Biloxi, Miss. “It was very exciting and was the launching pad for me to go on and perform with such artists as Barry Manilow, Prince and a show at the Las Vegas Hilton called ‘The Sunset Strip.’ Things have changed some since then, and if you are a performer, you, have to evolve. It is a hustle and bustle as an entertainer … very competitive. There used to be a lot of black performers on the Strip, but then came (what is called) the ‘black out.’ That is when many black performers, such as Darcus Speed and Gi-Gi, were cancelled. When things like this happen, you look around for black ownership to come in to give you options. But there is no black ownership on the Las Vegas Strip, so you have to conform and innovate other options,” says Mungin. A trained dancer who attended New York University, performed with Alvin Ailey and appears regularly with K.C. and the Sunshine Band, Ellis faces challenges with a spirit of optimism.